Council Cover up or just Council Copycat? Perhaps Contempt? It’s one of the first things that computer users learn. Seems that it is a lesson well learned by Council as well. On a Facebook group recently the following came to light. Names have been changed to ensure privacy. An innocent, but important question was asked about the progress of the refurbishment of our jetties. Their ‘use by’ date is almost upon them. Thank you for your interest in this important island infrastructure project. Council is in negotiations with Translink on funding for upgrades to the ferry terminals on Macleay, Russell, Lamb and Karragarra islands. 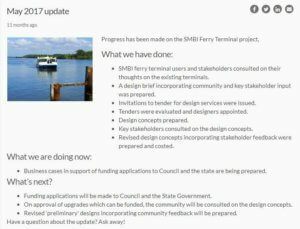 • SMBI ferry terminal users and stakeholders have been consulted on their thoughts about the existing terminals. • A design brief incorporating community and key stakeholder input was prepared. • Invitations to tender for design services were issued. • Tenders were evaluated and designers appointed. • Design concepts have been prepared. • Key stakeholders have been consulted on the design concepts. • Revised design concepts incorporating stakeholder feedback were prepared and costed. Business cases in support of funding applications to Council and the State are now being prepared. Once the business cases have been completed, funding applications will be made to Council and the State Government. On approval of funding, the community will be consulted on the design concepts, and revised or ‘preliminary’ designs that incorporate community feedback will be prepared. The designs are not currently available as it would not be helpful to consult the community on designs that don’t yet have funding. When we do have that confidence, the community will be consulted and the feedback we receive from the community on the concept designs will inform the preliminary designs. I cannot disclose the costs for works as per plans, as this is not public information. Now I don’t expect you to be able to read this, so I enlarged it. Now the parts which are 100% identical I marked in RED those which are almost identical I marked in YELLOW. I’ll leave the rest for you to check for yourselves. I don’t want to spoil all your fun..
Who are the ‘stakeholders’ key or otherwise. Translink involved in funding? They are a transport organisation, surely. Business case? The pontoons/terminals are a state provided service, funded by Queensland Government.